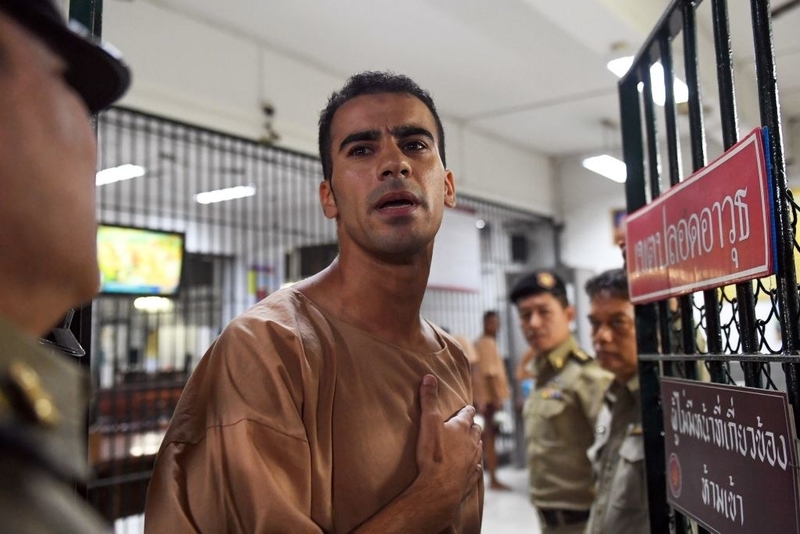 A campaign to free refugee soccer player Hakeem al-Araibi is spreading among sporting stars, after the Australian resident was denied bail in a Bangkok court on Monday. Hakeem al-Araibi is escorted to court in Bangkok on Feb. 4, 2019. Al-Araibi was granted permanent residency in Australia after he fled persecution in Bahrain and was recognised as a refugee. He has lived in Melbourne for four years, where he plays football for Pascoe Vale FC. The 25-year-old was arrested at Bangkok airport in Thailand in November, after travelling there with his wife for their honeymoon. He was detained under an Interpol red notice issued by Bahrain — a situation that should not have occurred in the first place, as refugees are not meant to be subject to international arrest warrants issued by the country from which they sought refuge. He now faces an extradition request to Bahrain, where he has been convicted of a vandalism offence. He strongly denies the charge and has argued he was playing in a televised soccer match at the time it allegedly took place. The fate of the footballer, who remains locked up in a Thai prison, is attracting worldwide attention in a campaign spearheaded by former Socceroo captain and football commentator Craig Foster. Stars including Robbie Fowler, Hope Solo and Gary Lineker have supported al-Araibi over the past few weeks. In recent days, Ivory Coast legend Didier Drogba, Socceroos Bailey Wright and Maty Ryan, and celebrated Australian swimmer Ian Thorpe have also spoken out. Al-Araibi appeared in a Bangkok courtroom on Monday, where his bid for bail was rejected. The hearing was adjourned until April 22 while each side prepares its case. In the meantime, al-Araibi will remain in custody. In a statement issued on Tuesday, Australian foreign minister Marise Payne said the Thai attorney general had confirmed al-Araibi could be released by executive order, and called on the Thai government to do so. “Mr al-Araibi is a refugee and a permanent resident of Australia and the Government remains deeply concerned by his ongoing detention in Thailand,” she said. Australian prime minister Scott Morrison has written to Thai prime minister Prayut Chan-o-cha requesting al-Araibi’s release, while Payne advocated for al-Araibi during a trip to Thailand last month. Former Socceroo and lawyer Francis Awaritefe attended a briefing from Thai prosecutors after the court hearing and told Radio National Breakfast the prospect of al-Araibi being released via executive order was “very much on the table”. The case has also put pressure on some of the world’s most powerful sporting bodies, which are being urged to do everything they can to free al-Araibi. FIFA has issued a public statement and has said it is advocating behind the scenes for al-Araibi. Awaritefe said international sporting bodies such as FIFA and the International Olympic Committee should wield their power by implementing sporting sanctions: prohibiting Thailand and Bahrain from hosting international soccer matches until al-Araibi is freed. “Football can use its global power for defending human rights,” he said.